The Bear Mountain Family Dome Camping Tent is definitely the perfect tent for the outdoor enthusiast. Part of enjoying camping and being outdoors is to be comfortable, but also be able to fully enjoy the nature around you while you're outside. That's exactly what this tent is about. The Bear Mountain's steel and fiberglass frame finally provides a 4-person tent that allows you to stand up and walk around. There are four windows, two of which are extra-large and offer you a screenhouse-like view of the vistas around you. Two fiberglass poles create awnings over the windows, so you can leave them open even during rain and look out. There are handy storage pockets sewn into the base of the tent, and the whole affair packs up into a duffel carrying case for easy transportation. Outdoor lovers rejoice - this is the tent for you. It is durable, it enhances your enjoyment of the outdoors, it keeps you comfortable, and the price can't be beat. Take your outdoor excursions to the next level by taking the Bear Mountain Family Dome Camping Tent on your next trip. Will this tent accommodate a queen size blow up bed? Per Google, a standard queen-size bed measures 60 inches wide by 80 inches long. As this is 96 by 96 inches, you could feasibly fit the blow up bed in the tent. For the tent model eCanopy Item Number: GGT-FT051. What is the weight, package size (dimensions), and the guarantee? Thank you for your question. The item dimensions are 15 x 15 x 20 inches, the item weight is 18 pounds, and this item carries a 5 year warranty. Does this tent have any mesh vents in it for ventilation? If so, are there flaps to close them for cold weather camping? Yes, it does have windows for ventilation and they also zipper shut when needed. Although you won't be able to put a large air mattress in the tent, it is fairly large inside. Because of the vertical sides of the tent, standing is no problem. All the windows manage to keep air flowing, so it manages to keep out moisture pretty well. No trouble setting it up, and it was extremely sturdy once fully staked. It is fairly light for such a large tent, so taking it with me was no problem The zipper seems to be of slightly lower quality though (it got stuck several times while I was using it). I have taken this tent backpacking before, but it has plenty of space for a tent small enough to take backpacking. Never had any problems breaking down or putting up, and the windows all provide excellent ventilation when open (although if you want some warmth, leave them closed). It's a great tent. I have had no problems whatsoever with this tent so far. When I go hunting, I take this tent with me for a place to sleep. Even with the great ventilation it provides, once the windows are zipped up there is no problem keeping warm. There was enough room to get everything I had with me into the tent, and also plenty of headroom if I wanted to stand. Setting the tent up was easy, even by myself, and the extra sized bag that it comes with is great for eliminating the frustration of trying to get a tent to fit. Poor Fly Design But I Still Love It! I cant say how much I love my tent enough! It was easy to set up and comfortable. It was waterproof and windproof. In fact, even though it poured down rain, I stayed cozy and dry. The only annoyance was that the zippers would get caught. The bottom zipper was the hardest to keep from catching. Although it is a sturdy tent, we pitched it on rocky ground and it got some holes in the bottom. They will patch easily, though. Did I mention how much I love my tent? This moderately priced tent is fine for the casual user. I needed one because I go to outside events like music festivals and this one was a reasonable price for occasional use. I did find the instructions were not helpful at all and made me feel like people were watching a slapstick comedy routine. In the end, it wasnt that difficult to set up, it was just confusing instructions that made it seem so hard. 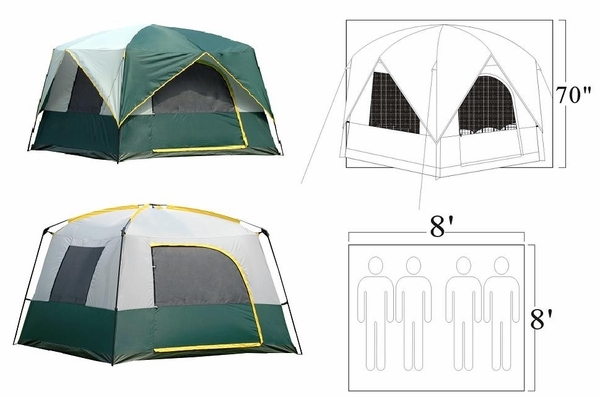 Make sure you attach the four angled hubs to the tent before you insert the crosspiece then join the crosspieces with the uprights. Although we were excited about getting this tent, once we started setting it up the instructions turned out to be very confusing. I'm afraid the first place this tent is going is back where we bought it. I was able to put this tent up by myself quickly and simply. It was very comfortable since I didnt have to crouch down like in some tents. I could stand with room to spare because of the ceiling height. Not only do all four walls have windows for ventilation, the great design allows air to breeze through when the windows cant be completely open due to bad weather. The walls of this tent give you plenty of standing room, and all that extra room makes this tent comfortable as can be. It keeps you very dry and is well ventilated. I have used this tent for just myself, but two people could just as easily camp in it. I have never had any problems with setup either. All in all, this is a great tent I would recommend to others. All the extra room in the tent is great. With two of us and two dogs, we still had room to get all of our gear inside the tent. Floor-space isn't the only room in this tent, it is also tall enough for someone who is six feet tall to easily stand up. I was used to tents that I had used in the military, so at first setting up the tent was a little confusing. It was pretty easy to get up once we understood how to put it together. Sealing the seams (which is a must for any tent) kept us very dry while it was raining, so waterproofing on this tent is great. Even though some people are saying that this tent is too heavy, once I had it secured on my pack there was no problem carrying it around comfortably (although I am used to heavy loads). So after camping in this tent for over a month, I can honestly say I would recommend it to anyone. Being able to stand up in a tent is great, and there is plenty of floor-space as well. I was camping in Hawaii, and the tent stayed well ventilated and dry. I used a tarp I had instead of the rain fly, so I don't know how well the fly works, but I stayed completely dry while there. If your looking for a good tent, you can't go wrong with this one. Although I had some problems understanding the instructions for the tent (it went together easily enough in the end), I am very pleased with its functionality. It is tall enough for my granddad to stand up inside, but doesn't have any wasted space. I will definitely be using this tent for a while.